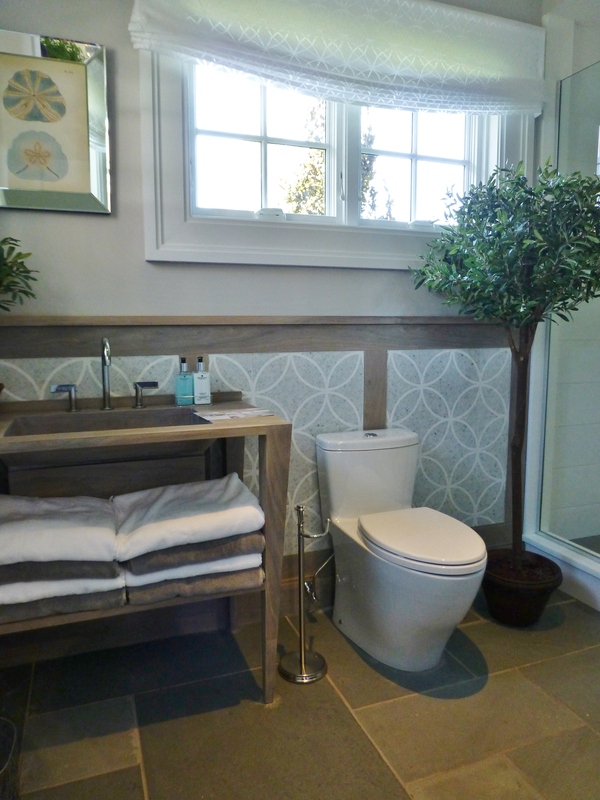 Welcome back to my tour of the 2014 Hampton Designer Showhouse. Last week’s post was about the outdoor terraces and pool area. This time I’ll be taking you into the special little pool house. I’m sure you’ll remember the terrific outdoor spaces leading into the cottage, which were designed by Caleb Anderson. 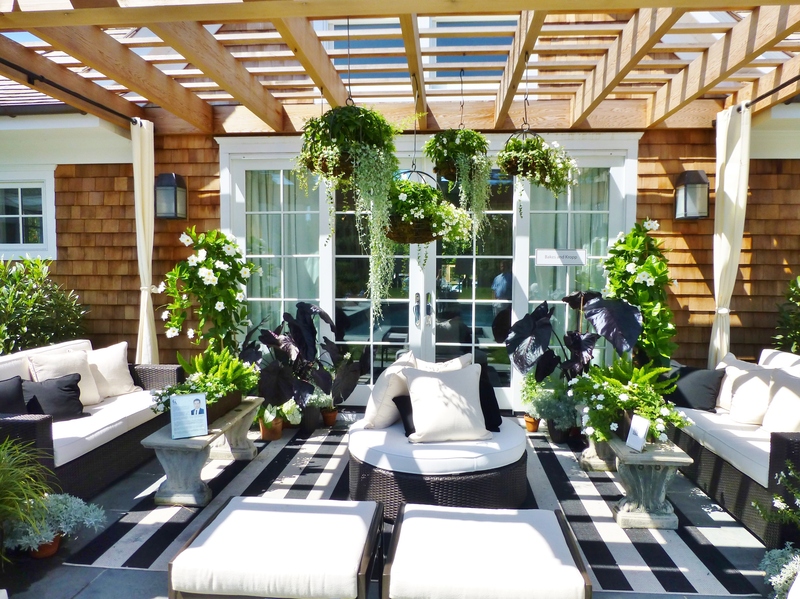 The terrace outside the quaint little pool house featured black and white striped outdoor carpets and accents under a lovely pergola. The main living area is very neutral with bluestone floors and warm gray walls in Farrow & Ball’s ‘Purbeck Stone’. The vaulted ceiling helps make the space feel a bit larger, as does the limited neutral color palette. All the furnishings were provided by Ballard Designs. Isn’t this a pretty space? Off to the right is the cute little kitchen. The kitchen continues the neutral color palette of greys and earth tones. 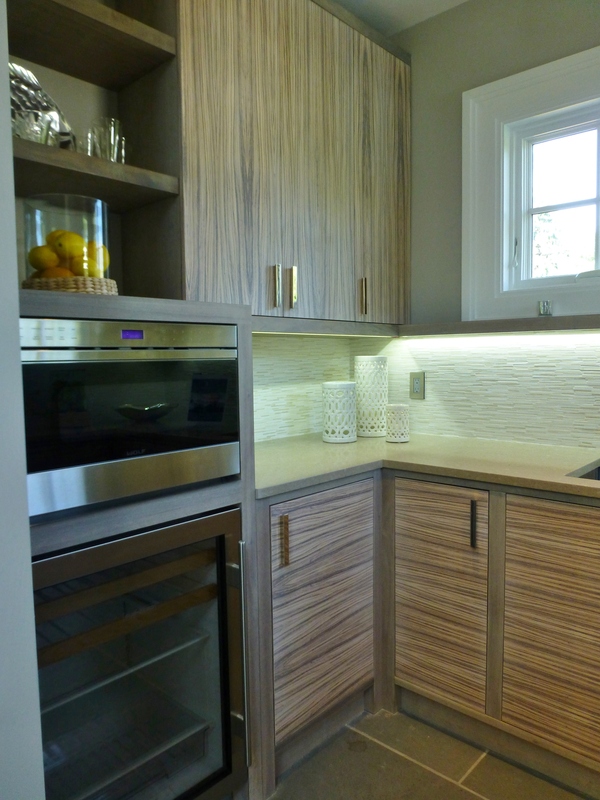 Notice the exotic zebrawood-grain on the cabinet doors, while the frames are a bleached gray wood called ‘Frosted Walnut’. 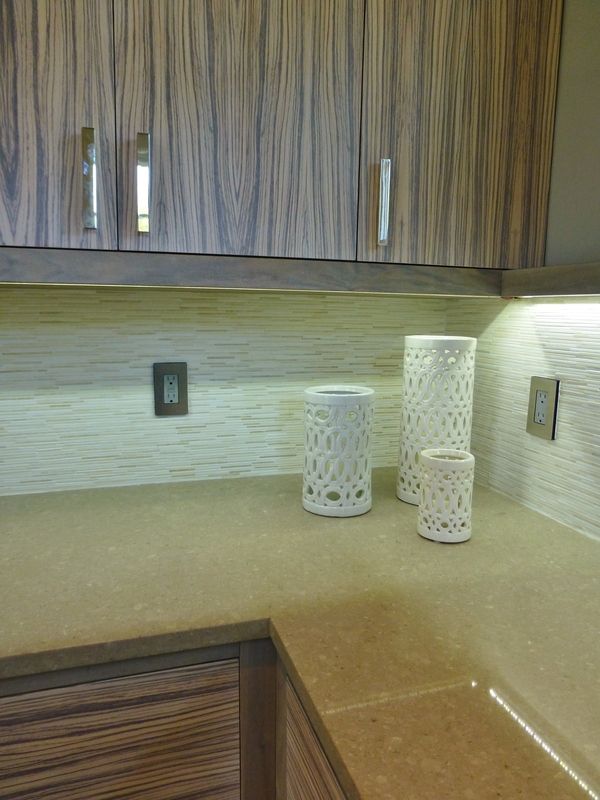 The backsplash is very subtle with strips of ivory stone. And there are plenty of metallics thrown in, with the stainless appliances and shiny nickel cabinet hardware. Here’s another shot of the kitchen cabinets, backsplash and countertops, which appear to be an engineered stone. Everything is very streamlined and simple in this thoroughly modern kitchen. The pool house also features a super-pretty bathroom. This was actually my favorite room in the pool house! I appreciate how the elegantly relaxed roman shade on the window has white semi-sheer fabric which mimics the same pattern in the gray and white wainscoting wall tiles. Did you notice that fantastic, and totally custom vanity? The wood vanity was so cool in this bathroom. 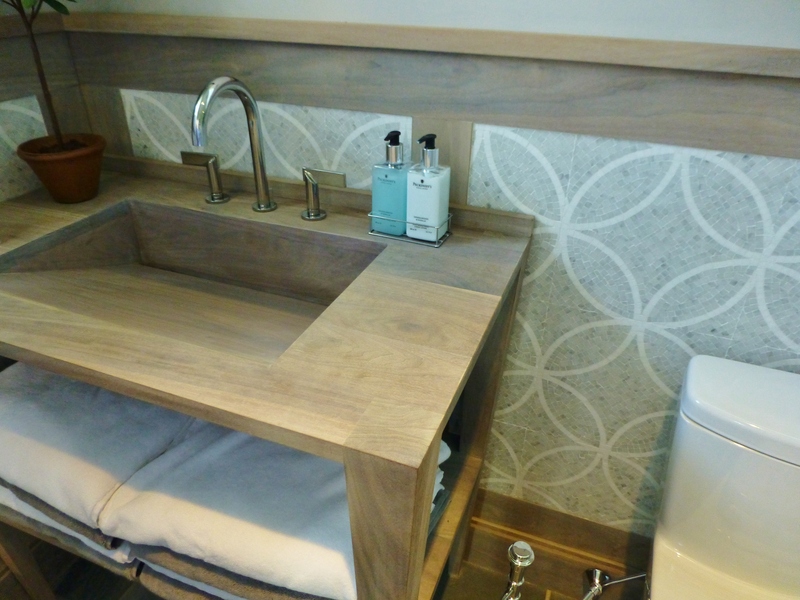 Check out the fully integrated wood sink! I’m especially fond of the beachy, bleached finish and the extremely simple lines of everything. 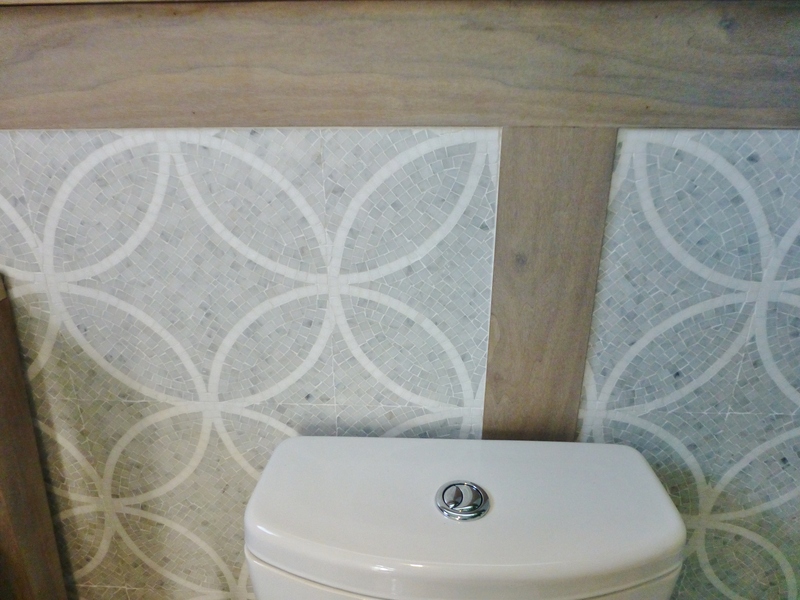 It’s also great how the woodwork on the walls coordinate with the custom sink base. The wood finish is the same ‘Frosted walnut’ that frames the kitchen cabinets. Here’s a closeup of the absolutely stunning micro-mosaic tiles on the walls of the guest house bathroom. It gives the room interest and texture in a traditional, almost classically Grecian way. This image is from an article on ‘The Editor at Large’ blog, which also has a brief photo tour of the 2014 Hampton Designer Showhouse. The angle of the photograph gives a wonderful sense of the entire space and the architecture of the main room. Click on the image to be taken directly to the article. There are additional photographs of this adorable pool house on the Bakes & Kropp Facebook page. 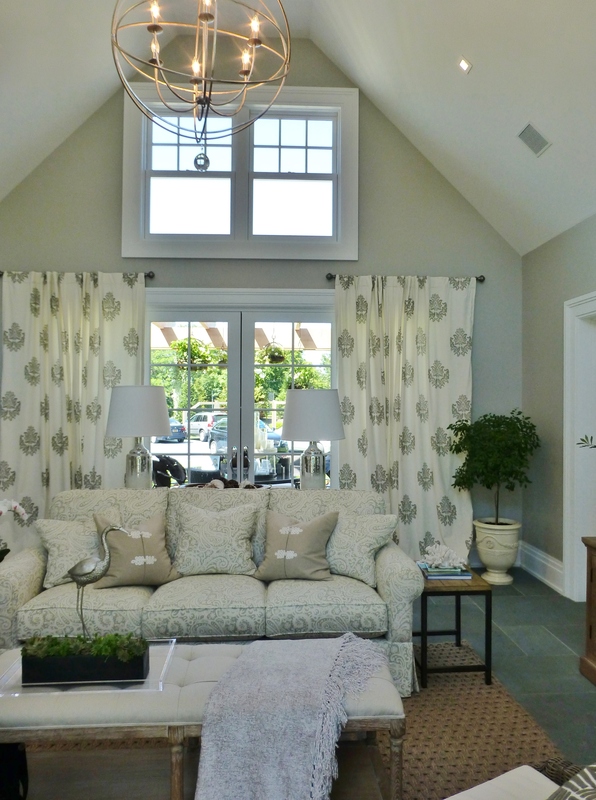 Next time we’ll go back inside the main part of the 2014 Hampton Designer Showhouse to see the primary living spaces. There are some beautiful furnishings and great interior design ideas in these luxurious rooms! Until then, leave me your comments below–I’d love to get your opinion on the beautiful little pool house at the 2014 Hampton Designer Showhouse. What was your favorite thing about the pool house? Did you like the bathroom as much as I did? And don’t forget to tell everyone you know about Kristine Robinson’s Interiors…I need all the friends I can get! This entry was posted in Designer House, Interior Design & Decorating, Mansion, Robinson Interiors, The Hamptons and tagged 2014 Hampton Designer Showhouse, Bakes & Kropp, Ballard Designs, Bathroom, Cabinetry, Frosted Walnut, Home, Integrated Sink, Interiors, Kitchen, Pool House, Zebrawood. Bookmark the permalink.